Our wonderful volunteer, Sheila Pinnington, dedicated her own time to create a beautiful cover for the table in the Quiet Room when it is used at occasions such as the Hospice’s Celebration of Life Service. 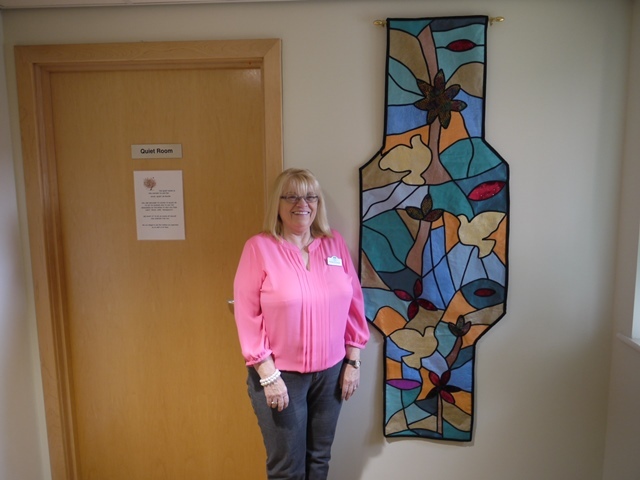 Sheila, who has been volunteering at the Hospice for 6 years, spent over 3 months creating the design, which was inspired by the stained glass windows in the Quiet Room where the table is kept. The Hospice’s Quiet Room is a dedicated space for patients, their visitors or even staff members to go to when they want to take some time to reflect on their thoughts or feelings, or to have a spiritual moment if they wish. The room has a calming, relaxed atmosphere and is located in a quiet area of the Hospice. Sheila also used this as an opportunity to develop her own skills, using organza fabric to create the piece, a fabric she says she’d never worked with before. Craft-loving Sheila, also produces knitted chicks for Easter every year with fellow volunteer, Anne McAdam, and sells them online donating all of the proceeds made to Woodlands Hospice. The duo plan to do the same again this year, after raising over £260 with last years’ effort – only stopping because they ran out of chicks to sell! Her latest creation now has pride of place on display outside the Hospice’s Quiet Room, brightening the corridor, however, it will be used as a table cover for important occasions such as the Celebration of Life which the Hospice hosts twice a year, to remember patients we have recently lost. A huge thank you to Sheila for her fabulous work!